Equivalent Part Numbers ALFA ROMEO: 55350048, AUTLOG: LM1125, AUTOMEGA: 140032310, BLUE PRINT: ADG07420, BREMI: 30126, DELPHI: AF10193-12B1, ELTA AUTOMOTIVE: FDM970, XAM4015, EPS: 1.991.276, ERA: 558066, ESEN SKV: 07SKV096, FACET: 10.1276, FEBI BILSTEIN: 37228, FIAT: 11140004, 55183651, 55350048, FISPA: 38.758, 38.758-2, HELLA: 8ET009149-131, HERTH+BUSS ELPARTS: 70640702, HOFFER: 7516079, KAMOKA: 18036, KW: 491276, LANCIA: 55350048, MAGNETI MARELLI: 213719760010, MAXGEAR: 51-0103, MEAT & DORIA: 86079, METZGER: 891012, MOBILETRON: MA-B078, MOTAQUIP: LVMA391, NGK: 97588, NIPPARTS: N5408003, NPS: S560I05, OPEL: 55350048, 93178243, QUINTON HAZELL: QM726, QM882, SIDAT: 38.758, 38.758-2, SMPE: 19659, 19659-M, EAM045, LMF139, MAFS032-M, MAFS032-OE, STELLOX: 61-06112-SX, STEYR MOTORS: 55350048, SUZUKI: 13800-79J50, 1380079J50000, 13800T7950001, SWAG: 40937228, TOPRAN: 206969, TRISCAN: 881210010, VALEO: 253745, VAUXHALL: 93178243, VEMO: V40-72-0462, WILMINK GROUP: WG1014121, WG1430022, WG1495153, WG1498077. The only way to be 100% sure that the part will fit your vehicle is to check the part number on your original unit matches one of the above. Any information in the compatibility table is for reference only and there may be unspecified choice options. If a part is faulty a replacement will be sent out after the return and testing of the old unit. Labour claims & consequential loss claims are never accepted. The item "Bosch Mass Air Flow Meter Sensor 0281002683 GENUINE 5 YEAR WARRANTY" is in sale since Friday, May 18, 2018. 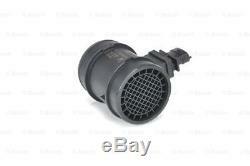 This item is in the category "Vehicle Parts & Accessories\Car Parts\Air Intake & Fuel Delivery\Air Intake & Fuel Sensors". The seller is "rtgroup11" and is located in PR25 3US. This item can be shipped worldwide.